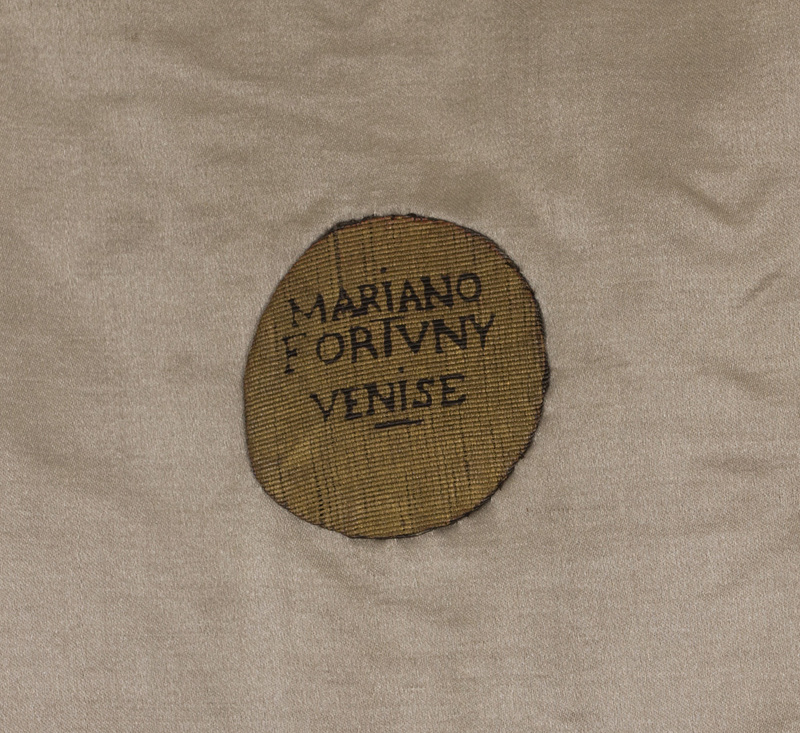 Mariano Fortuny y Madrazo created some of the most remarkable textiles of the 20th century. 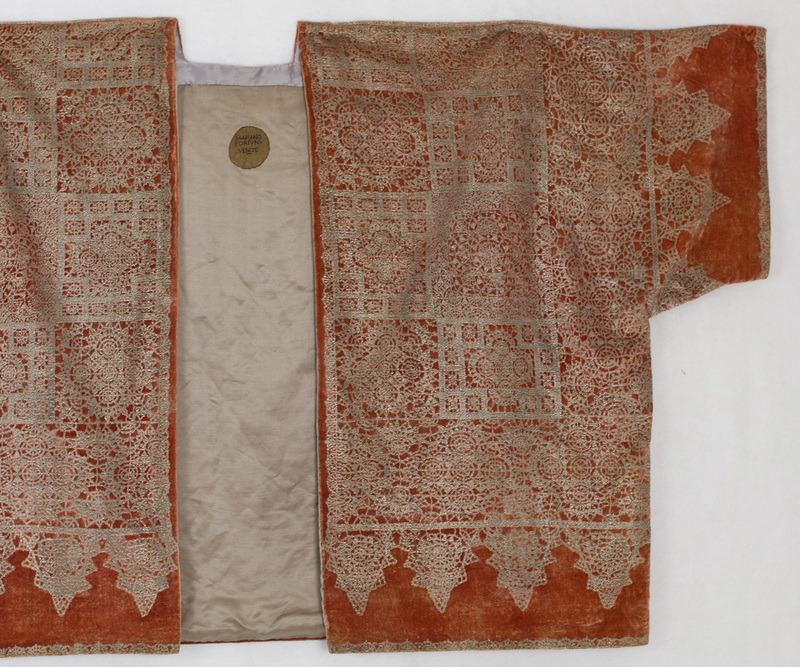 In his brilliant, multifarious output, Fortuny often drew inspiration from antique textiles. He did not simply copy the old designs; he reinterpreted them to achieve an aesthetic ideal. His famous atelier was located in Venice, an important center of the Renaissance textile trade with the Orient. The Venetian aesthetic tradition was a rich source of ideas from ancient Persian and Islamic cultures. 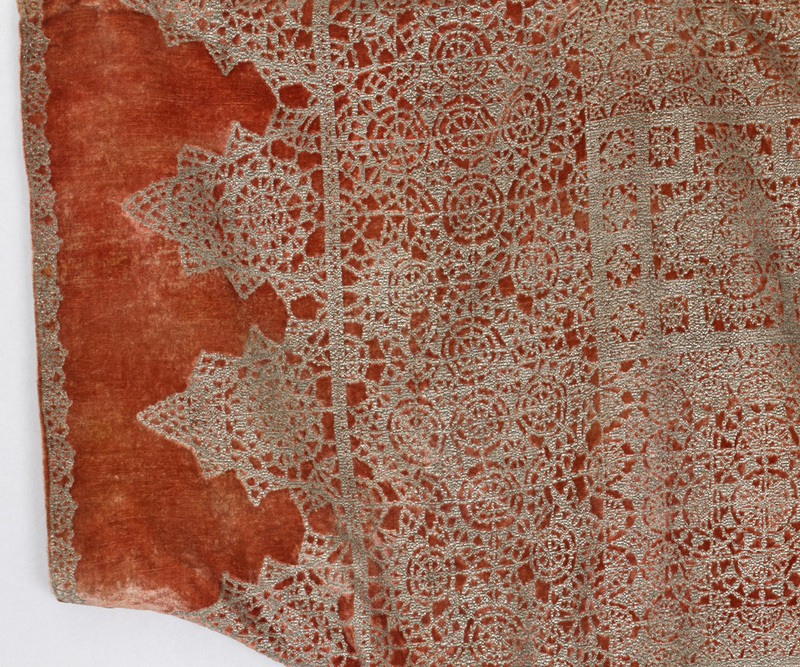 The "lace" pattern shows Fortuny's inspiration often came from several sources. By a kind aesthetic dialectic (to coin a term), he synthesized ideas to create a new and different design. 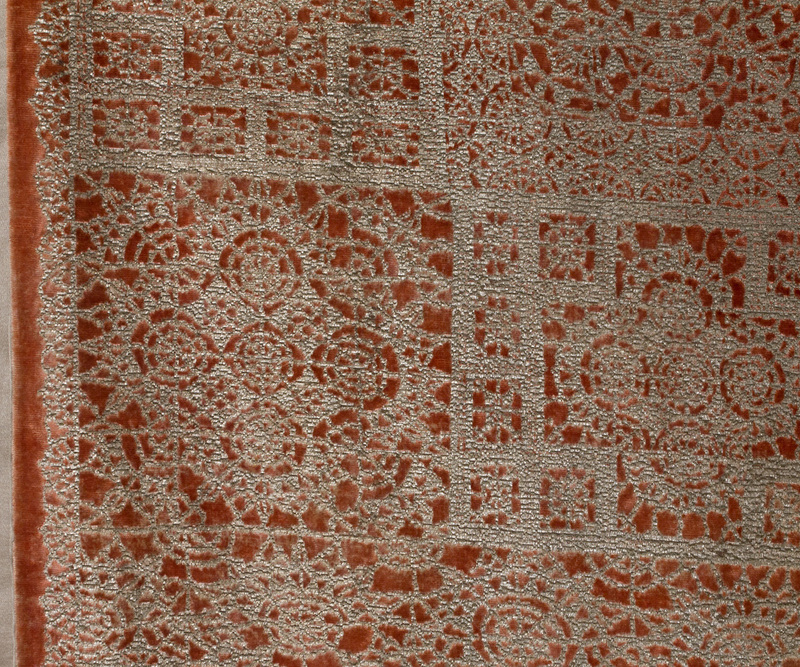 Here Fortuny ingeniously combines blocks based on Islamic tiles with borders based on 17th century lace. To appreciate the masterly "lace effect," zoom in on the picture below. The pattern is hand stenciled with layers of subtly changing silver/gray pigment, reproducing the Renaissance fresco effect. The ground cloth of terra cotta silk velvet drapes beautifully. The effect shifts from subtle to sparkling as light hits the different layers of pigment. 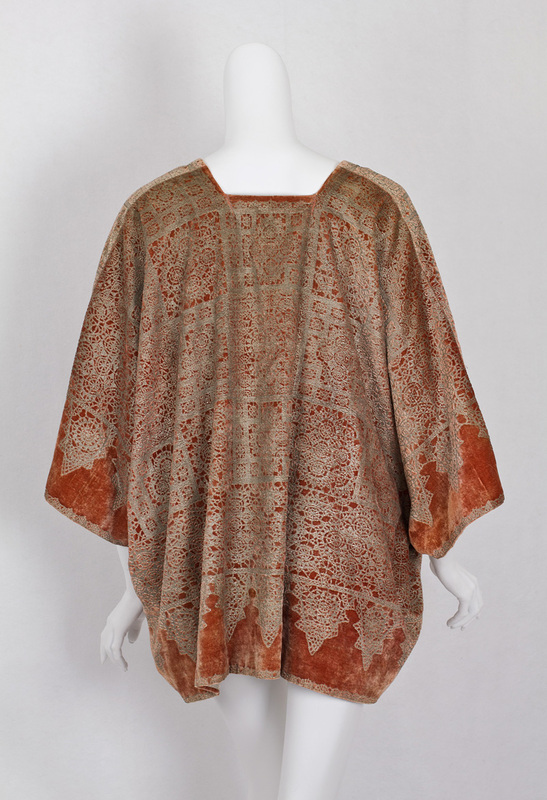 Fortuny's methods of hand dyeing and hand stenciling ensured that no two garments were exactly alike. The jacket is totally lined with gray silk satin. Fortuny's designs have endured as timeless works of art. His creations transcend the rigid dictates of fashion. 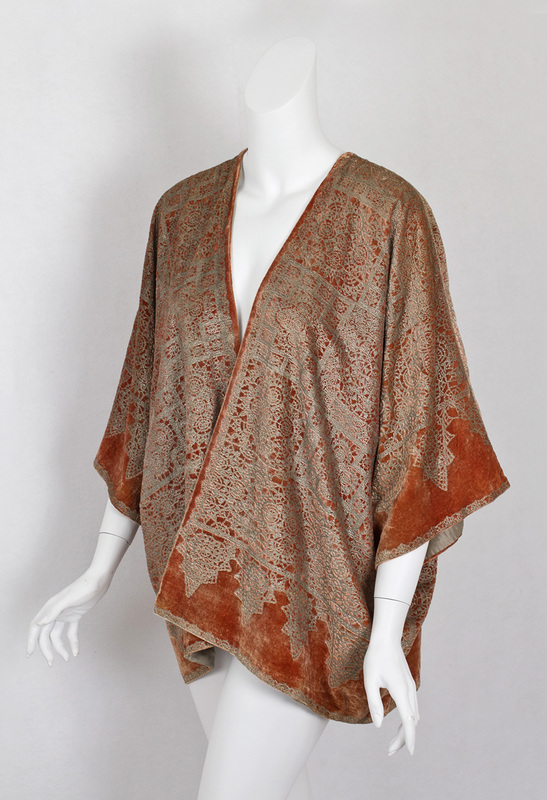 A Fortuny design, an unconditional statement of beauty, nevertheless adapts itself to the wearer and to the occasion. 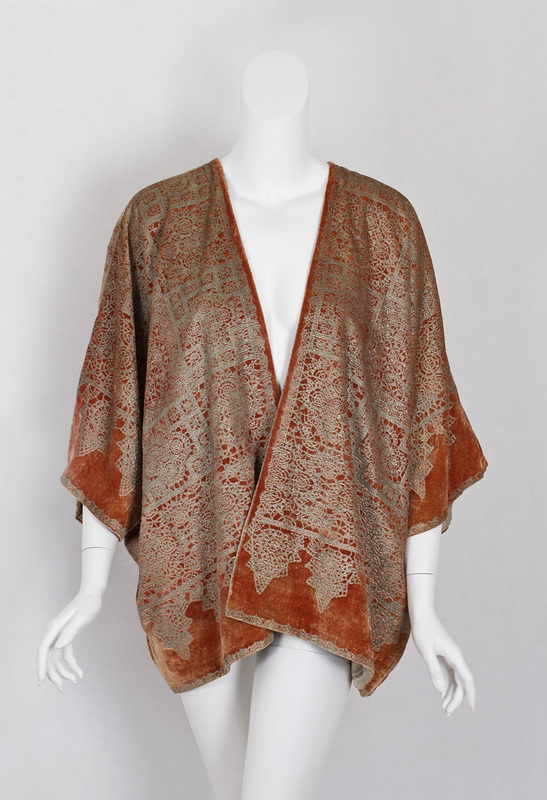 Meant to be worn over a Fortuny Delphos tea gown, the jacket can be equally dramatic over pants and a sweater. 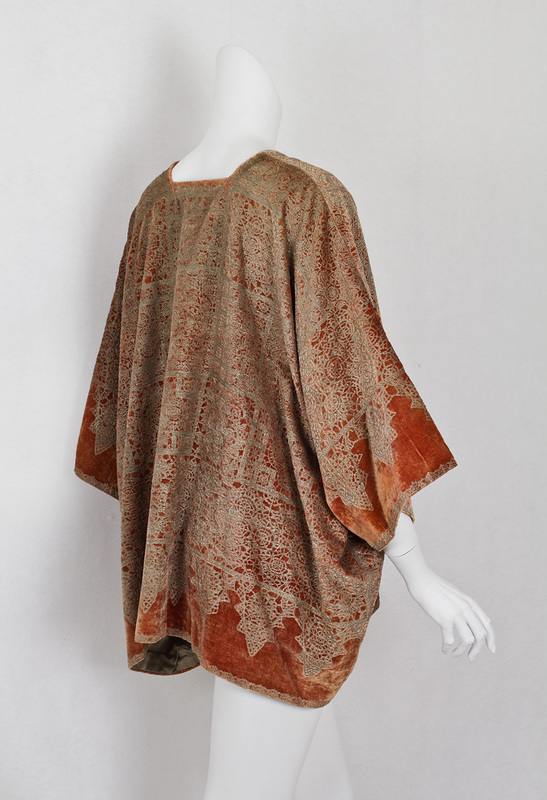 Although known today primarily as a textile designer, Fortuny was also a painter, etcher, sculptor, photographer, lighting engineer, set designer, theatre director, inventor, and architect. In the field of design, he personified the Renaissance man who could do it all. 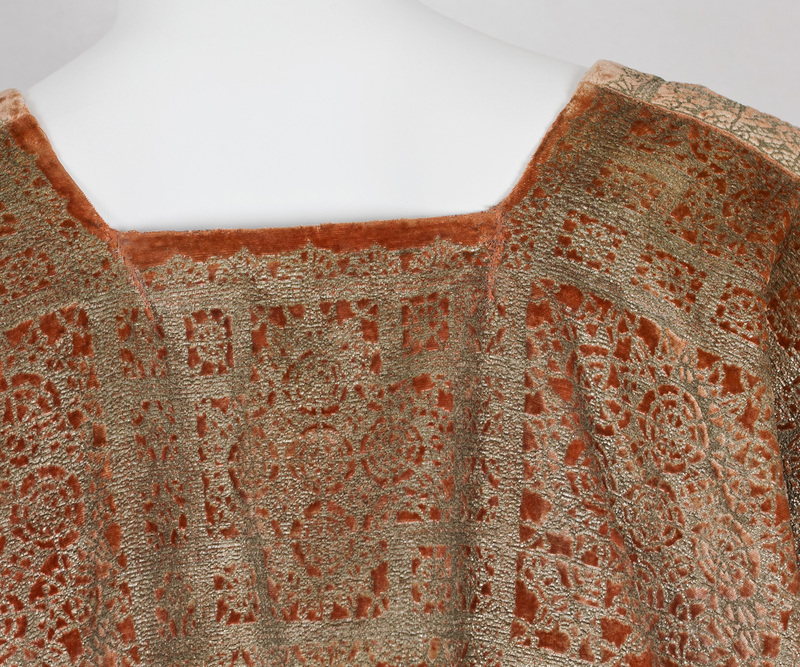 In the graphic arts, Fortuny's obsession was color in all its intricate subtlety. He made himself an expert in the manufacture, mixing, and application to textiles of dyes—especially from natural sources. There has never been a greater creator of color masterpieces in textile than Mariano Fortuny y Madrazo. As a young man, he stated, "Art is my life's aim." His work is a living testament to that ideal. The condition is almost excellent. On the back neckline corners are two small mended tears that have been backed for support. They are inconspicuous and stable. The lining has a small back-neckline patch. These minor imperfections, which do not spoil the design integrity of this important collectible, are reflected in the price. The jacket displays well and can be gently worn. The jacket has a 68" circumference and is 28" long from shoulder to hem.